This week @nancy , @libby , @animalfreak9 (Elisha), and I all went to Natalie’s farm. Natalie (well, really her mom Alex) has four horses. Tally, Spruce, Shakespear, and Almond. NOTE: When I say “we” I mean Nancy, Liberty, Elisha and I. Possibly Alex and Natalie as well. Just pay attention and you’ll understand just fine. On Tuesday after Elisha and I had coding class, we all went to start our drive. The drive was about two hours. On the way we stopped at Chic-Fil-A for dinner. Elisha got herself and I SMALL icecreams. Chic-Fil-A’s icecreams turn out to be really big. So we all shared two icecreams (besides Nancy). Then we drove and drove until we got to the farm! Nancy and Liberty slept outside in a tent, The rest of us (including Natalie) slept on the floor in the living room. We were going to sleep in Natalie’s bedroom but it was super hot up there. Her room is essentially the attic of an old house (it’s CONNECTED to the barn. Natalie’s window is a view to the barn. I assume that’s old). It doesn’t have any air conditioning and with three bodies inside it would of possibly roasted us during the night. Therefore we opted to sleep downstairs. After deciding where we would sleep all of the kids went to say hi to the horses. 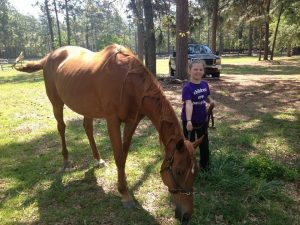 All of Natalie’s horses are retired racehorses. Tally (Tallahassee Star was his racing name) is the biggest, and he is 22. He’s also top in pecking order (he’s the president). Next in pecking order is Spruce (vice president). He is 26 years old and his long name is pronounced Spruce-kip-aid. Third in pecking order is Shakespeare. He is maybe 16-21? I can’t remember right now. Then there’s Almond. She is the only girl, only 10 years old, and the lowest in pecking order. Basically she gets pushed around a bunch. They stayed out in a paddock overnight. Before bed we all sat in the living room at talked. Some of us had a snack. I really liked petting one of their dogs; Jennifer. I can’t remember how old they said she was, but from ages 10-15. She’s medium sized so she was much older than a young dog that age. Their other dog is a 4 year old chihuahua; very different. His name is Felipe and he didn’t like any of us very much. After an hour or two we all started going to bed. I fell asleep by 11:30 because I was soo tired and I ignored Elisha and Natalie talking. Apparently a bright light was shone in my eyes to see if I was asleep. I don’t understand what was going through their minds when that happened. We all woke up from 6:30-6:45, me being the latest to wake up at 6:45. Right away, in my pajamas we all got a horse on our own (the adults stayed back and made breakfast because they’re awesome like that). I got Spruce, Natalie got Tally, Elisha got Shakespeare, and Liberty got Almond. We led them all with halters and leads to their stalls. At 8:00am the farrier came. (And here is where the bunches of pictures start). The horse’s hooves are made of the same material that your nails are made of, and they grow just like ours. 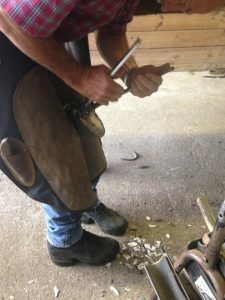 The farrier takes off the horseshoe and puts it to the side. Then he goes and clips the hooves! The result? a giant version of a toenail clipping. From each hoove. Then he files the hooves down a bit. He didn’t talk to us at all during it, so I don’t really know why. But he did. If he needed to then he cleaned the hoove before seeing if he had to reshape the shoe. If he did then he hit it with a hammer and used something that made sparks fly everywhere. 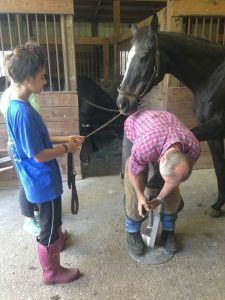 Once the hoove was ready the farrier held the shoe up to the hoove. He tooks nails and a hammer and hammered the shoe on. This doesn’t hurt, though, because the hooves are just giant nails that don’t have feeling in them. After that the farrier files the hoove one more time. He farrier-ed 16 hooves that morning! 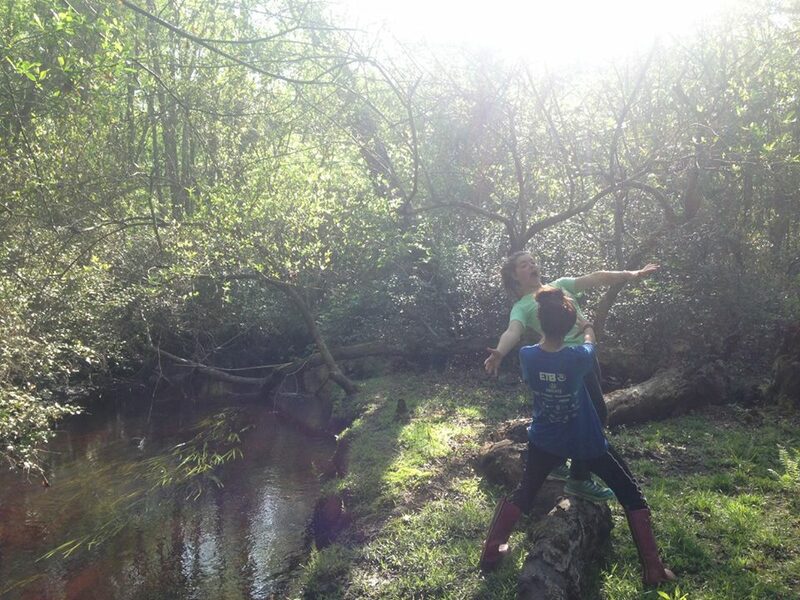 Everyone got bored and Elisha and Natalie went and played inside. Nancy, Liberty and I all went on an exploration. 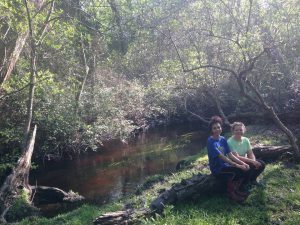 Natalie’s property consists of some wooded land around a creek. 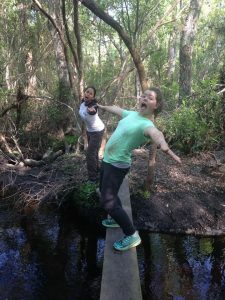 We took some pictures and had an awesome time! Though for quite a bit of it we weren’t even in Breedan territory. As you can see I almost fell into water more than once on more than one occasion in more than one kinds of water. 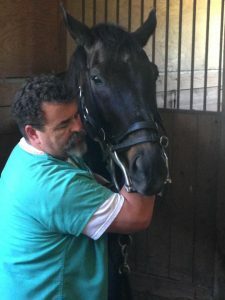 When we returned the farrier was STILL working on the horses! 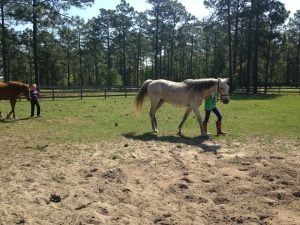 After the farrier came and left, we led the horses back to the paddocks. I took Spruce back. Nancy didn’t get a picture of me leading Spruce, but she did get these. After that we just hung out. I got into my day clothes and changed out of my pajamas. We all changed, brushed teeth, stuff like that. We also put together a puzzle, Nancy gave LIberty henna, and I colored a fox in Natalie’s coloring book. At 11:00 the dentist came! This was awesome and by far the best part of the trip (hence it being the whole point we came there). The dentist was SO nice. He had 11 year old and 12 year old girls and was super friendly. What horse dentists do is file down the teeth. I know that sounds absoloutely and totally disgusting and painful, but trust me, it’s for the good of the horse. Since horses chew in a circular motion instead of an up and down motion, they wear their teeth sort of pointy. This makes it much harder more painful for them for them to chew food. 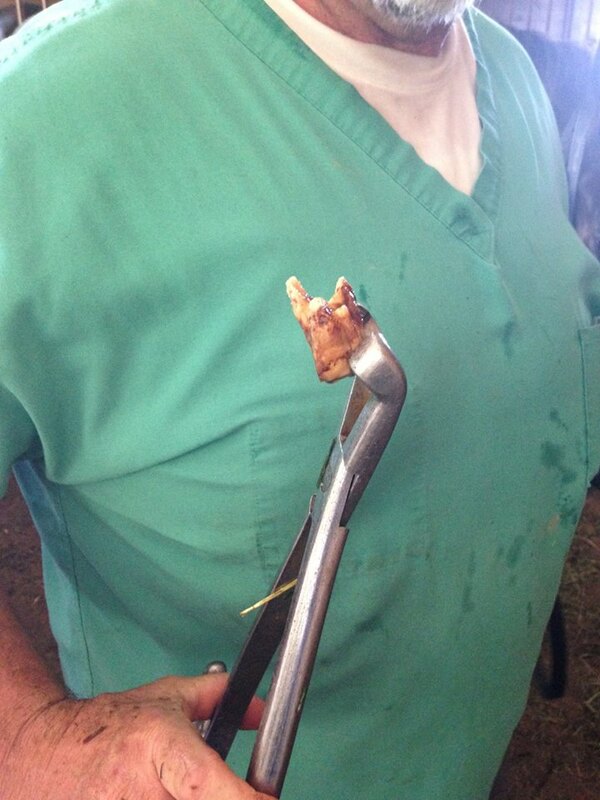 Filing the tooth allows for the horse to eat much easier. To put his hand in the horse’s mouth, he gives them a shot. 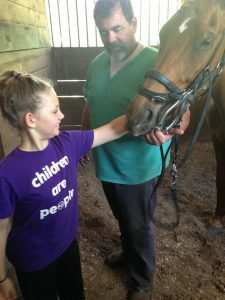 He injects sedative into a blood vessel in the horse’s neck. This way they’ll be calmer and won’t get all riled up. 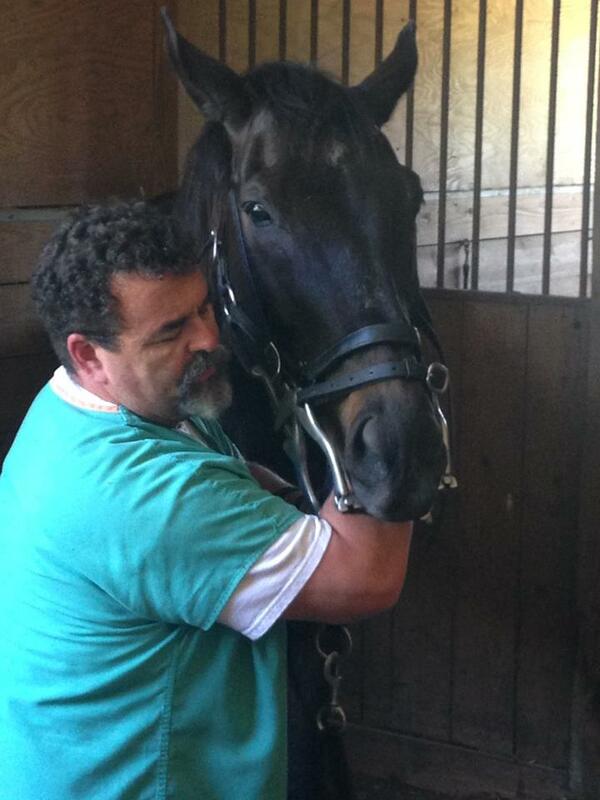 Next the dentist put a special halter that holds the horse’s mouth open enough for the hand and arm to go in. The horse’s mouth goes all of the way to where the eyes are! The tounge is a spiral shape too. It aids in getting the food to the back of the mouth. Female horses have 36 teeth, and males have 40. This is because in the wild the males are the protectors of the herd and they have sharp two pairs of canine teeth that can bite flesh. 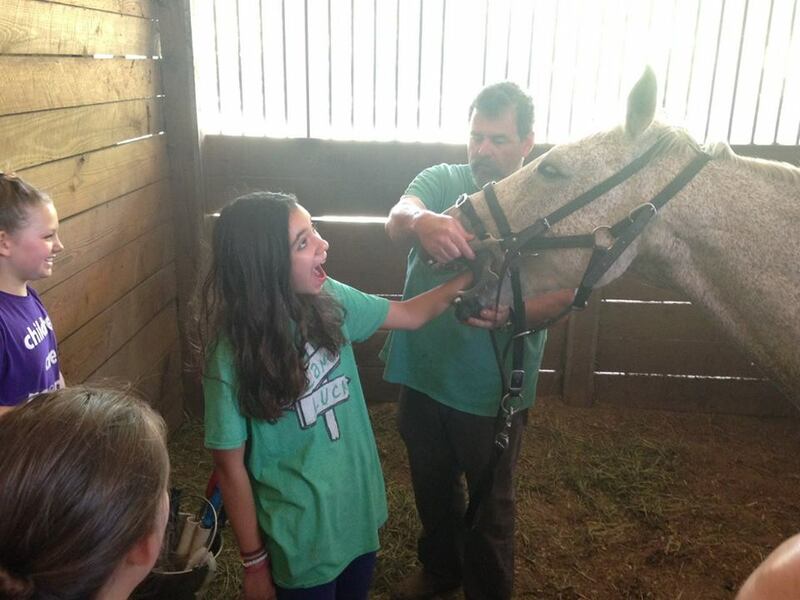 Horses can only open their mouths 2-3 inches on their own, at least for an extended amount of time. That’s why they feel sore on their face after dentist appointments; they aren’t used to having their mouths so far open. Horse teeth stink. Badly. SUPER. DUPER. HORRIFICALLY BADLY. Just kidding they aren’t that bad. But sometimes they can be deadly stinky. A lot of people ask why their horses need dentist appointments if they don’t have them in the wild? The dentist said that yes, horses in the wild don’t have dentist appoinments. But they also die much sooner than horses with care from humans. Tally did pretty well in his appointment. He wasn’t the best of the four but Alex said that it was the best he had ever done. Spruce was also pretty calm from what I remember (the details are starting to fade; it’s been a week and a half). But Spruce had something special! He got a tooth pulled! Horses naturally lose teeth as they get older. Spruce, being 26, was at high time to lose a tooth. Shakespeare was the best (at least in the beginning). He was so good that the dentist let us put our hands in his mouth! He had been eating and so there was a bunch of chewed up food in his mouth which was pretty gross. We felt the tounge moving too! After we all put our hands in the mouth Shakespeare reared up in his stall. Probably because he was extra sore from us all putting out hands in and it taking longer than usual. Lastly was Almond. She was just fine. 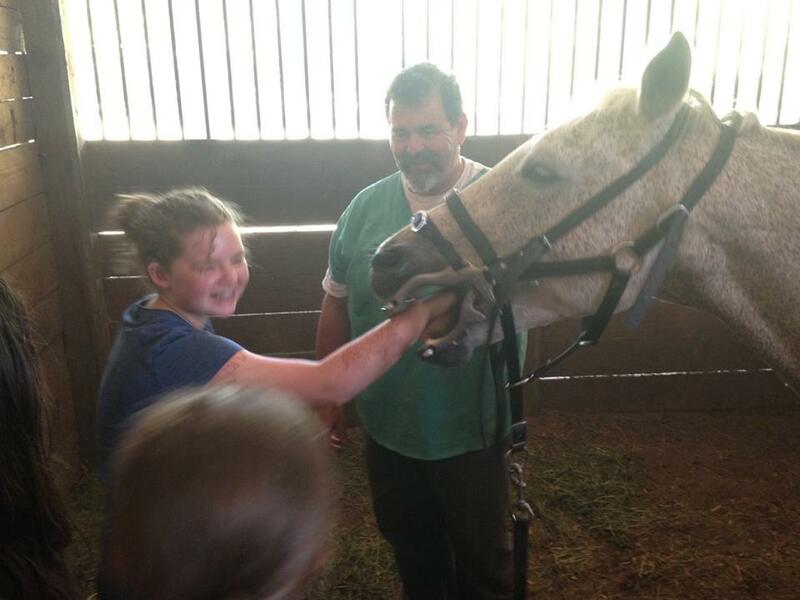 At the end of all of the appointments the dentist squirted water into the horses’ mouths. This got all extra tooth-dust (tooth equivalent of saw dust) and any blood. All of the horses had blood but it looked like a lot more than it was because it was mixed with water. They were all normal. Then the dentist left. We had to eat quickly and say goodbye to the horses. Then we packed up and left!